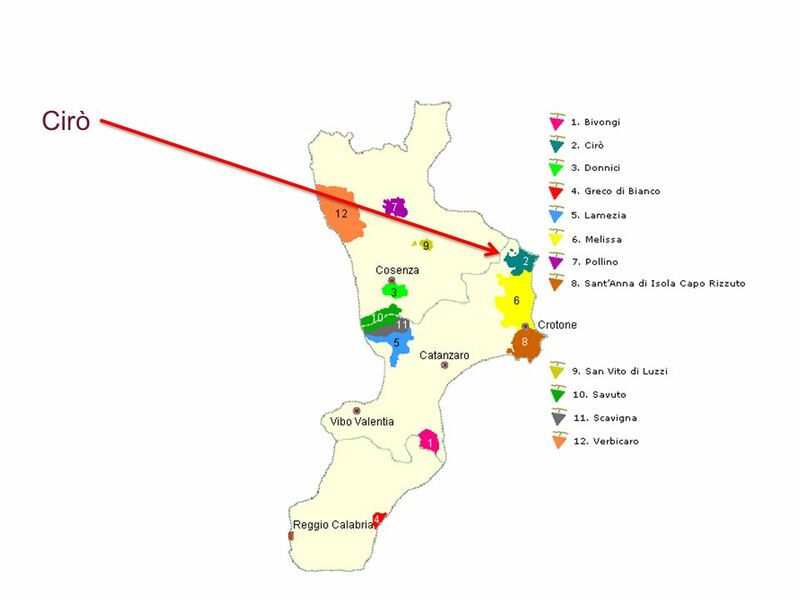 2 Does Sangiovese have what it takes to make internationally successful wines today? 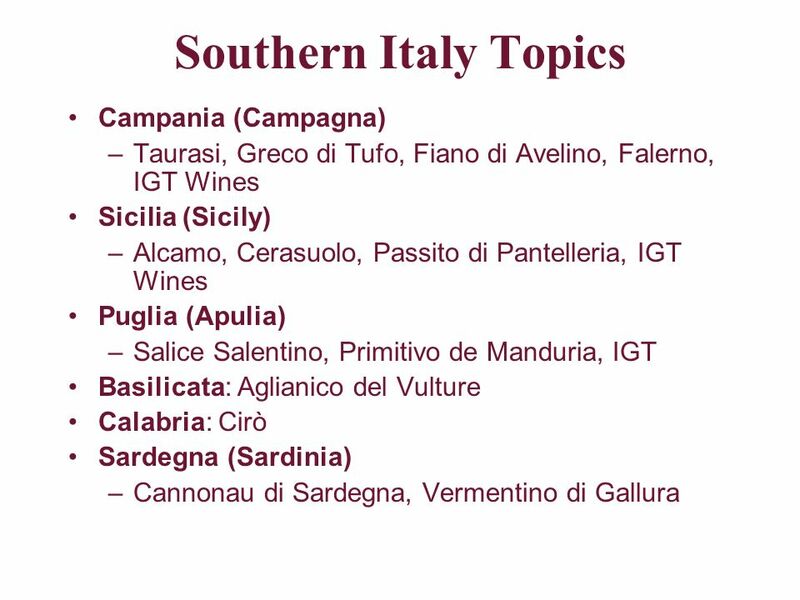 Discuss with specific reference to the wines and regions of Central Italy. 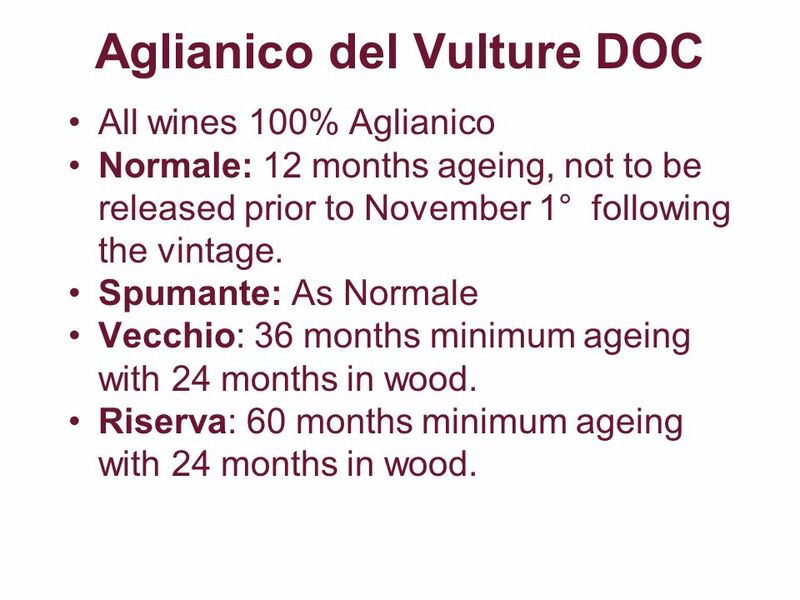 All wines 100% Aglianico Normale: 12 months ageing, not to be released prior to November 1° following the vintage. Spumante: As Normale Vecchio: 36 months minimum ageing with 24 months in wood. 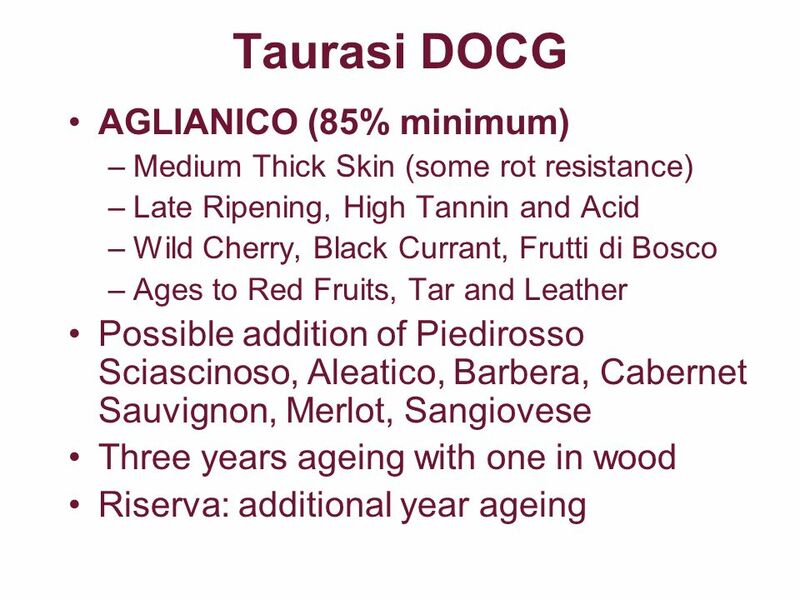 Riserva: 60 months minimum ageing with 24 months in wood. 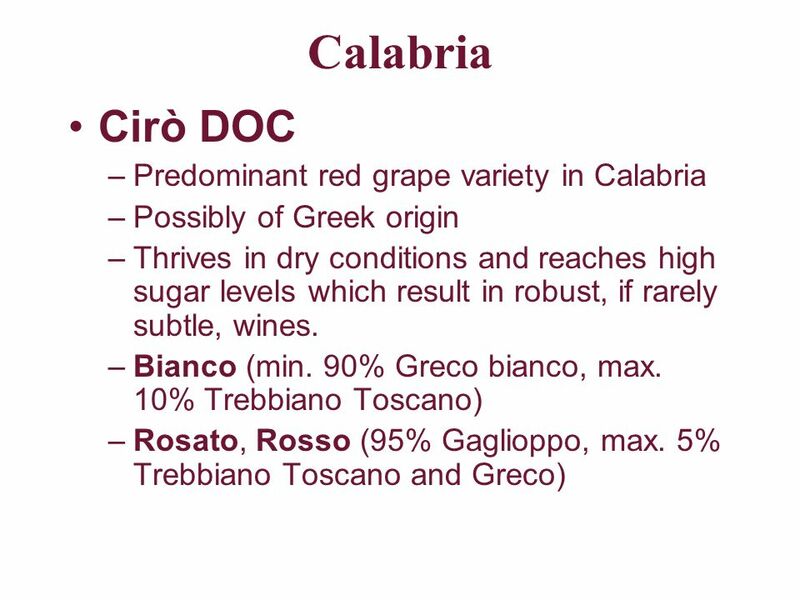 Possibly of Greek origin Thrives in dry conditions and reaches high sugar levels which result in robust, if rarely subtle, wines. Bianco (min. 90% Greco bianco, max. 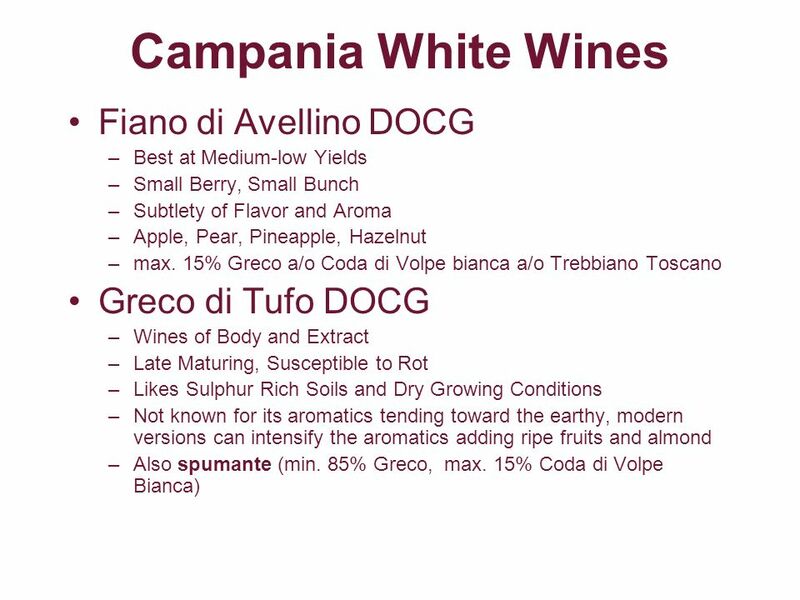 10% Trebbiano Toscano) Rosato, Rosso (95% Gaglioppo, max. 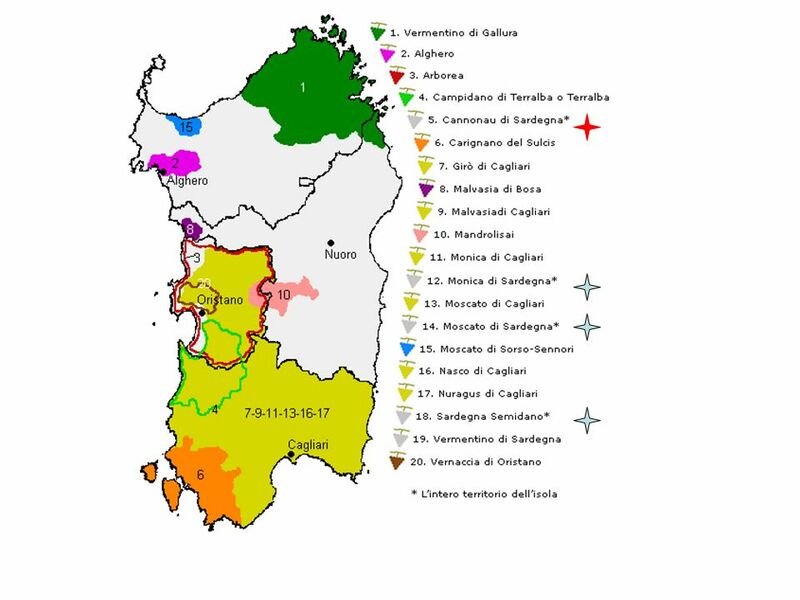 5% Trebbiano Toscano and Greco) Frappao: The vine, however, is very common in Sicily, especially in the area around Vittoria. 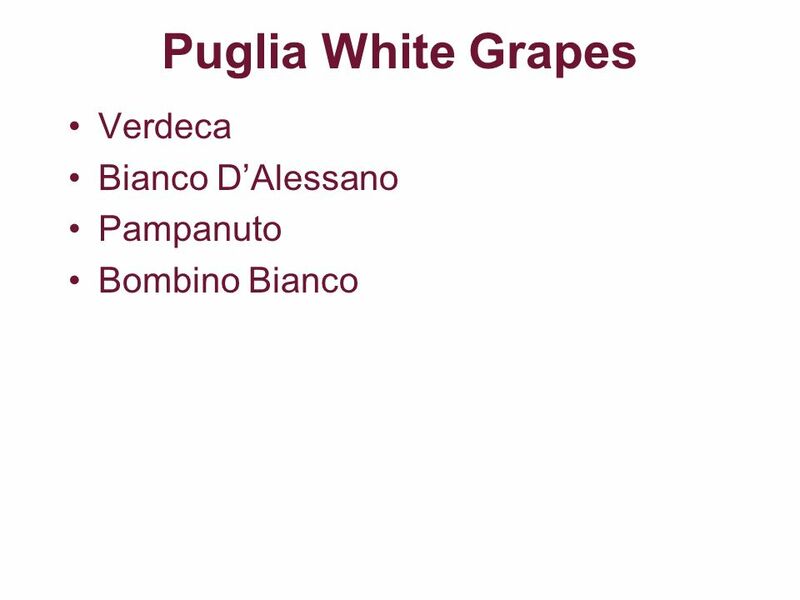 The grapes ripen around the first week of September and produce flavorful wines with hints of marasca cherry and pomegranate. 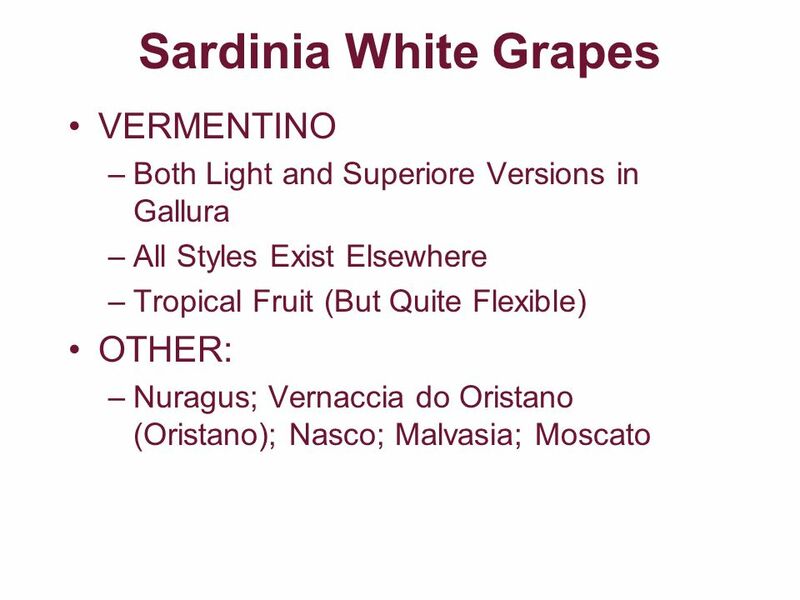 It is one of the base grapes used in the making of Cerasuolo di Vittoria wine and is part of the specification for the Eloro DOC wine. 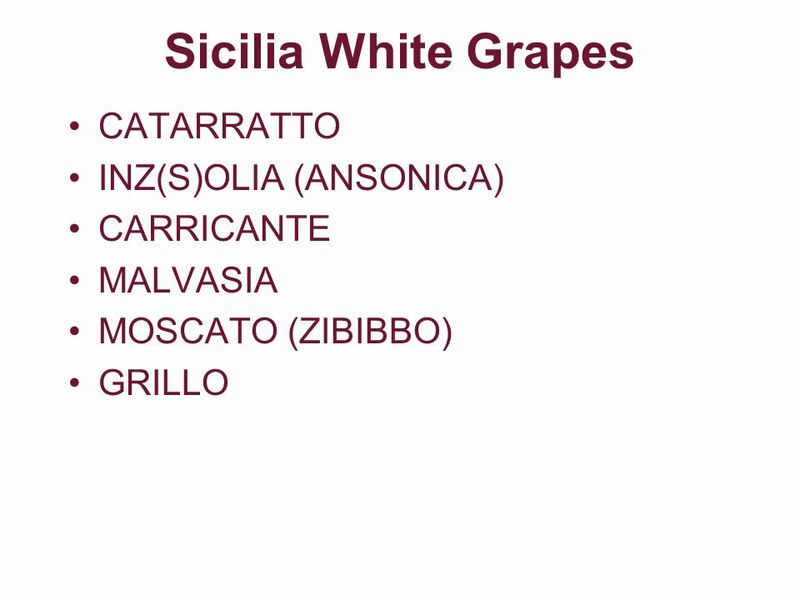 Monovarietale Bianco Pinot Bianco (min. 85%, with Chardonnay a/o Sauvignon max. 15%) Rosato, Rosso min. 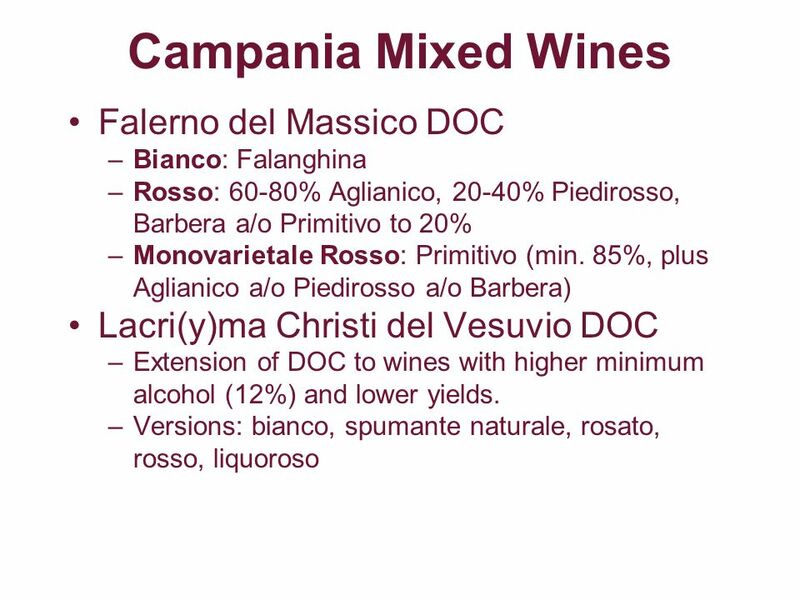 80% Negroamaro, plus Malvasia Nera di Lecce a/o di Brindisi Monovarietale Rosso min 85% Aleatico plus negroamaro a/o malvasia nera a/o primitivo max Copertino DOC Min 70% Negroamaro, max 30% Malvasia Nera di Brindisi a/o di Leccea/o Montepulciano a/o Sangiovese (max 15%) Second largest high volume producer, mostly bulk, but a growth in quality. 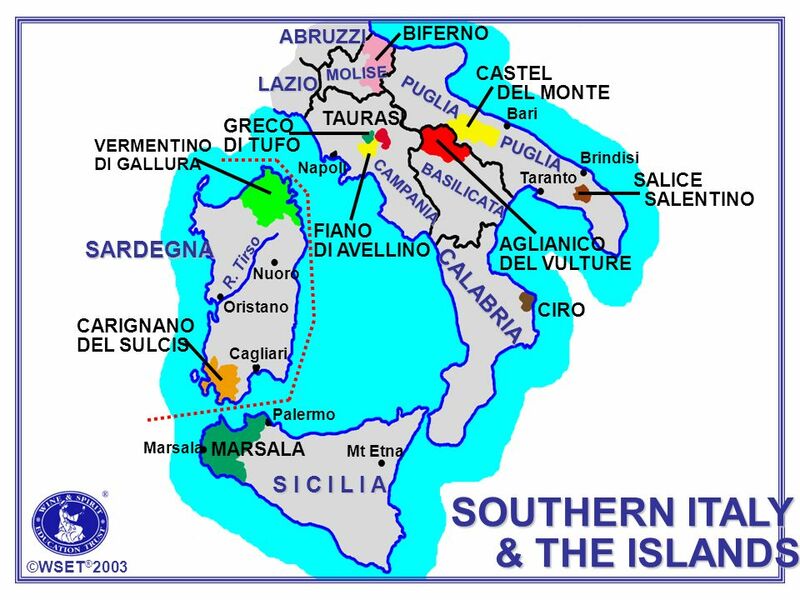 Interest in quality IGT from this region – Hot maritime climate. 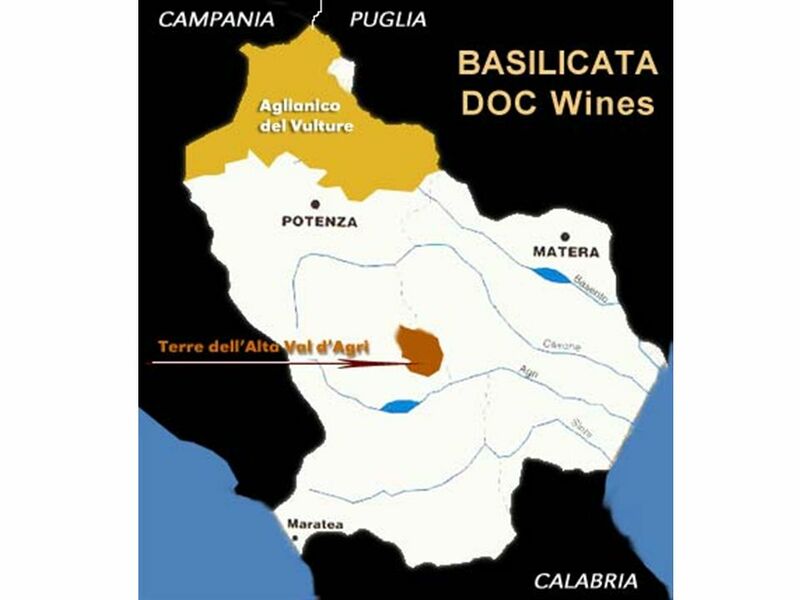 50%-60% Verdeca, 30%-35% Bianco d’Alessano Up to 5% Fiano a/o Bombino a/o Malvasia Toscana IGT Wines 6 IGT categories Second largest high volume producer, mostly bulk, but a growth in quality. 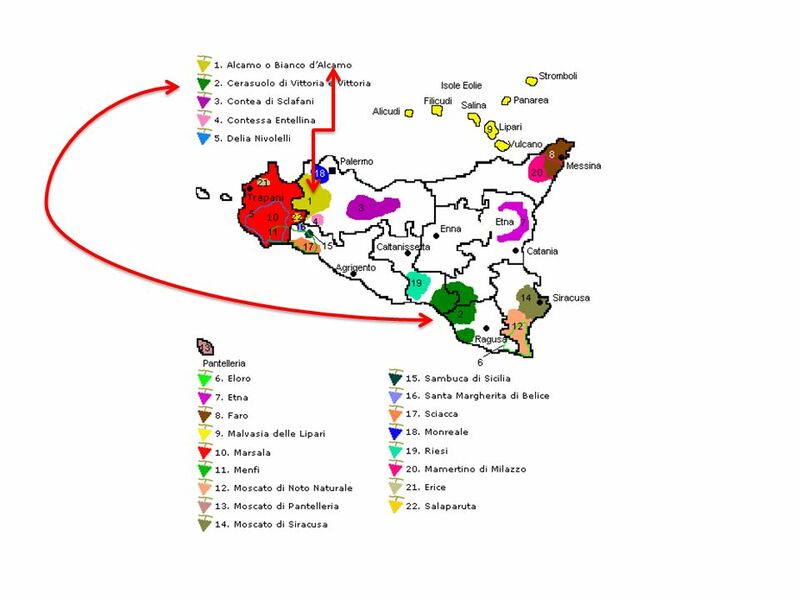 Interest in quality IGT from this region – Hot maritime climate. 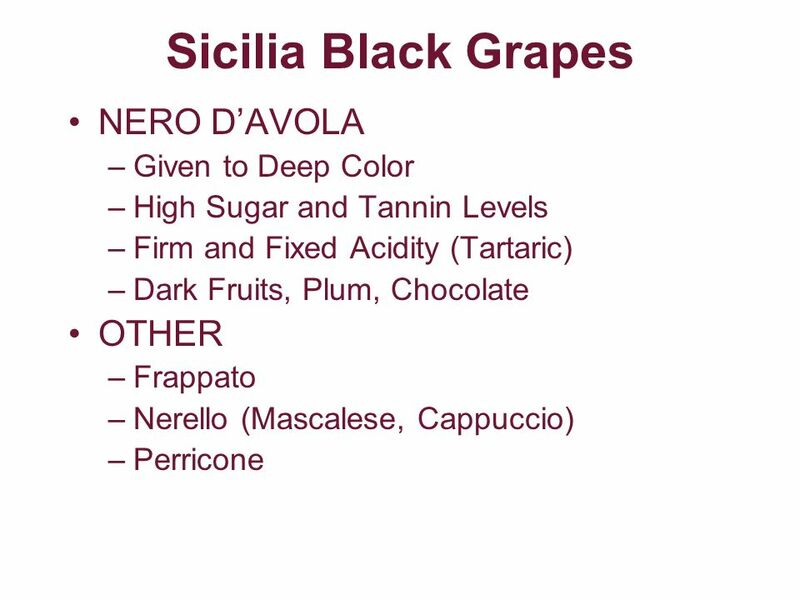 24 Puglia Black Grapes NEGROAMARO PRIMITIVO OTHER: Albania? Xinomavro? 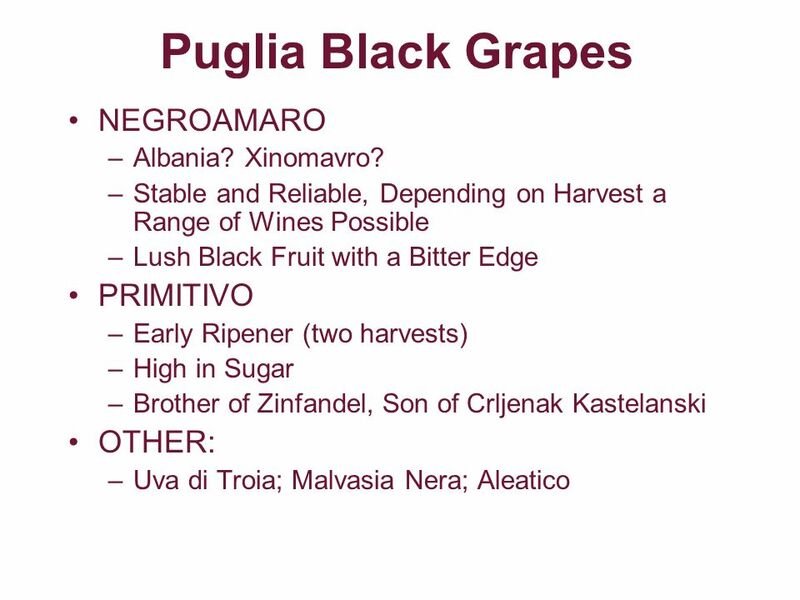 25 Puglia Black Grapes NEGROAMARO PRIMITIVO OTHER: Albania? 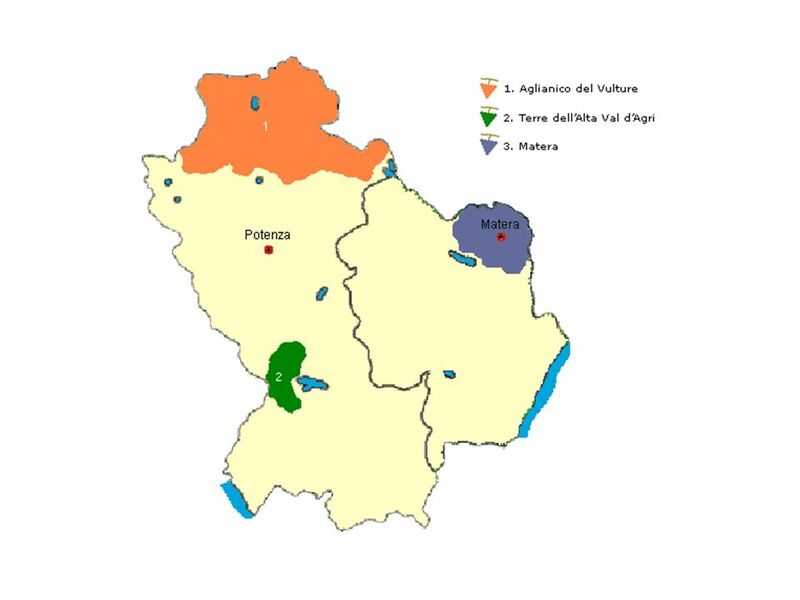 Xinomavro? 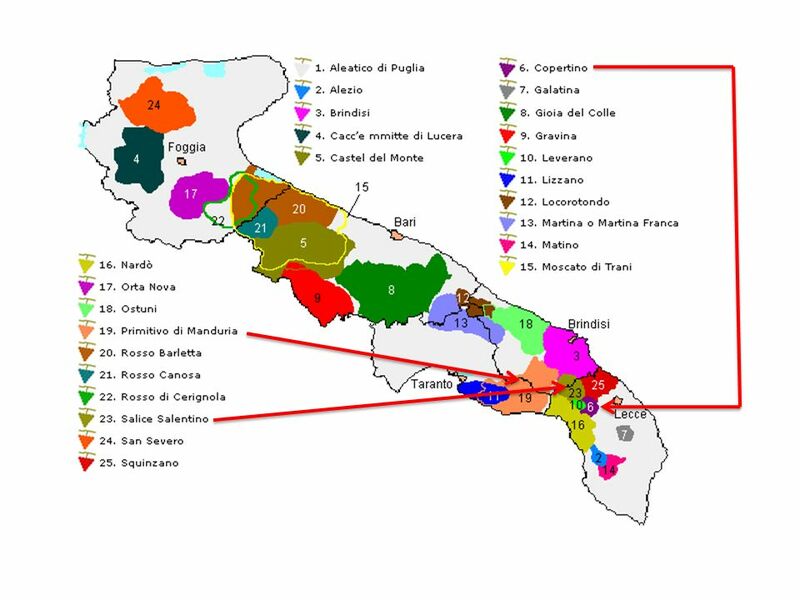 28 According to the data released by the Chambers of Commerce of Cagliari, Oristano, Nuoro and Sassari, the production of DOCG wines accounts for the 3.02% of the total, the DOC for the 17.42%, the IGT for the 2.97%, with the remaining 76.59% good quality table wine. 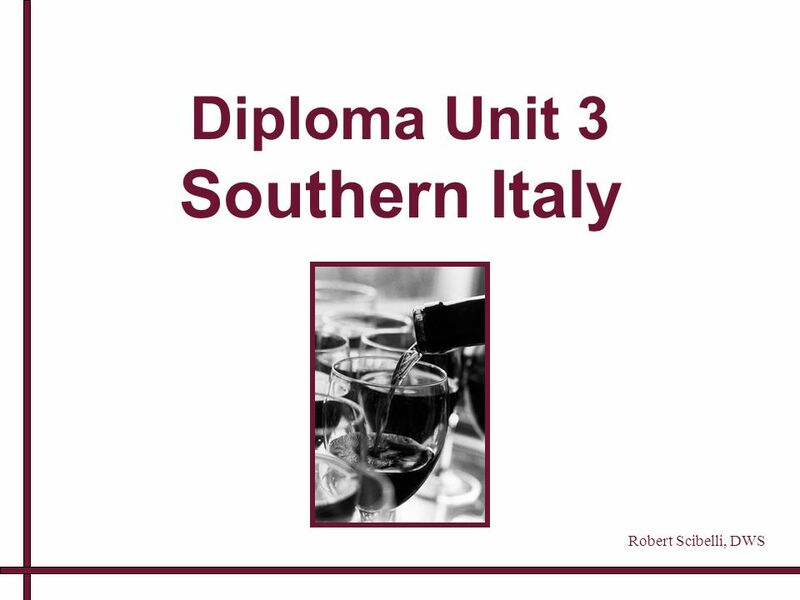 Download ppt "Diploma Unit 3 Southern Italy"
WINES & CHEESES from ITALY Sat, millions inhabitants -20 regions -103 provinces ITALY. NIES November Event. Pilgrim’s Market Thanksgiving Outside the Box Sara Ray. 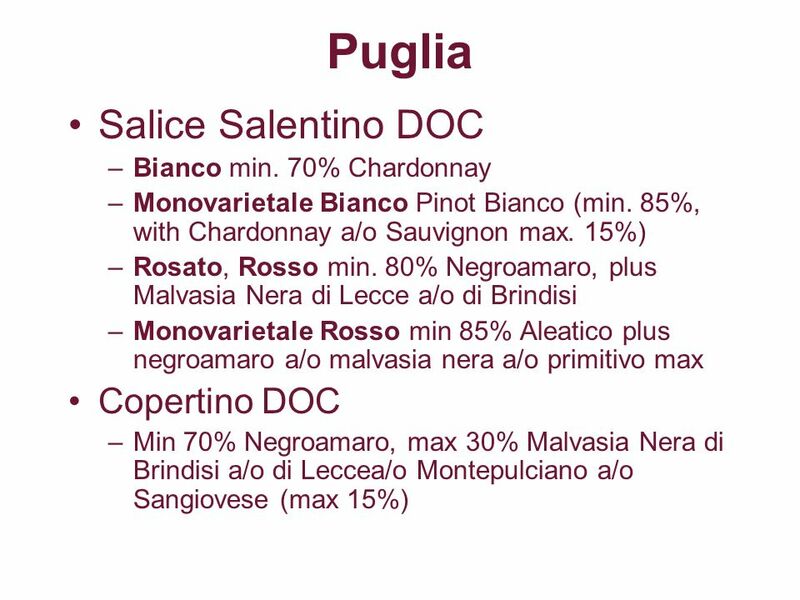 ITALIAN WINE By: Chef Wayne Fullmer. November Wine Tasting Sparkling Wines John and Ci Niznik Lonni Wersal. 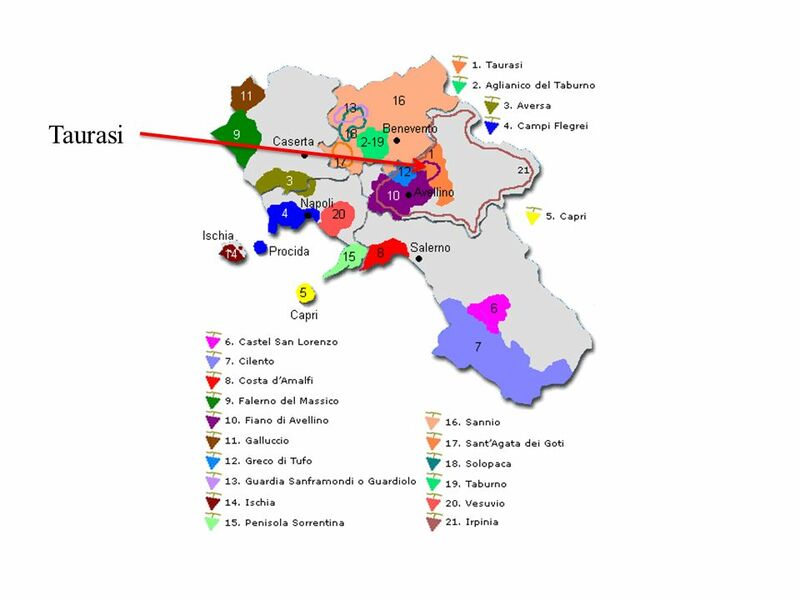 MAZZONI ROSSO DI TOSCANA 2010 A Super Tuscan blend of two of the world’s greatest grape varieties (Sangiovese. 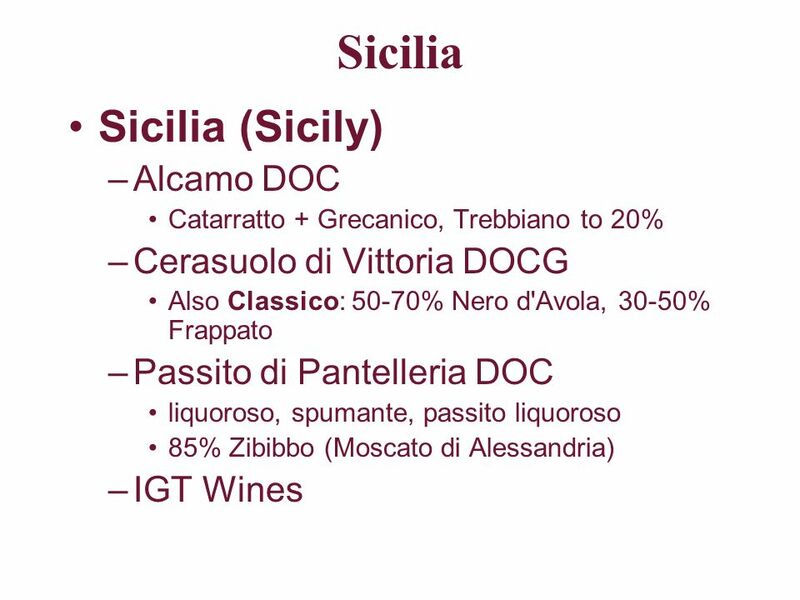 Brought to Sicily by the Greeks and flourished starting from 800 BC (the major Greek colonization of Sicily), wine production in Sicily has been around. What is Wine What is Wine? “To Serve with Knowledge & Pour with Skill” copyright 2002 The Wine Society of Texas all rights reserved. EMERGING GRAPE VARIETIES Ashley Ratcliff/ James Freckleton/ Nick Dry The Yalumba Wine Company. 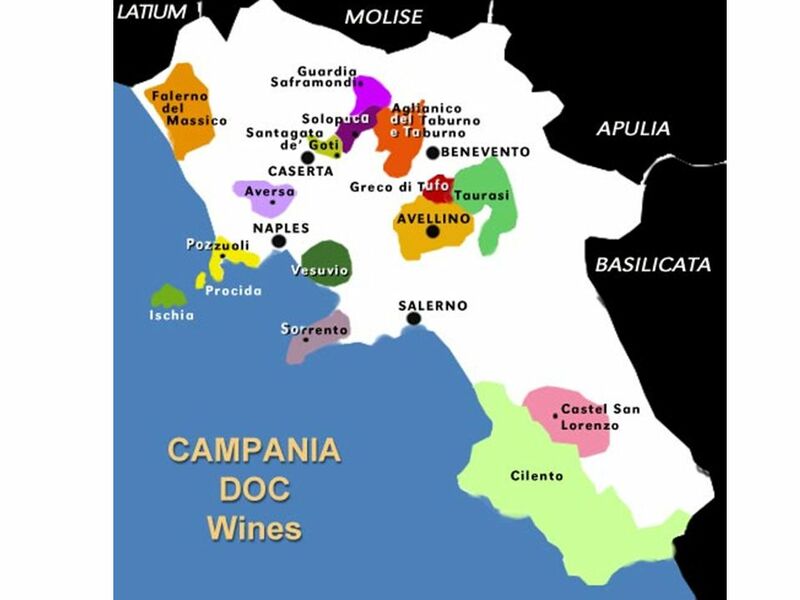 Campania, Villa Matilde. Maria Ida Avallone & Salvatore Avallone with Riccardo Cotarella Maria Ida Avallone. 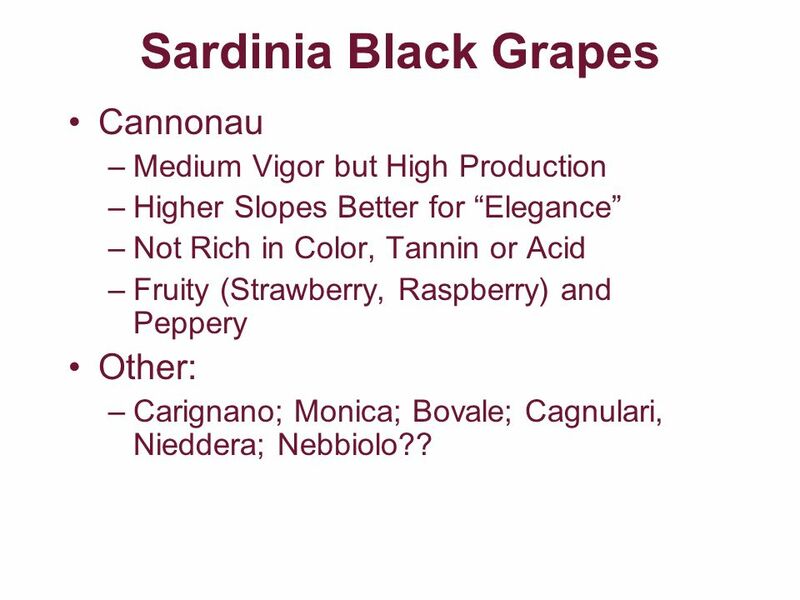 Lecture 3: The Harvesting Decision: Viticulture from the Winemaker’s Perspective. 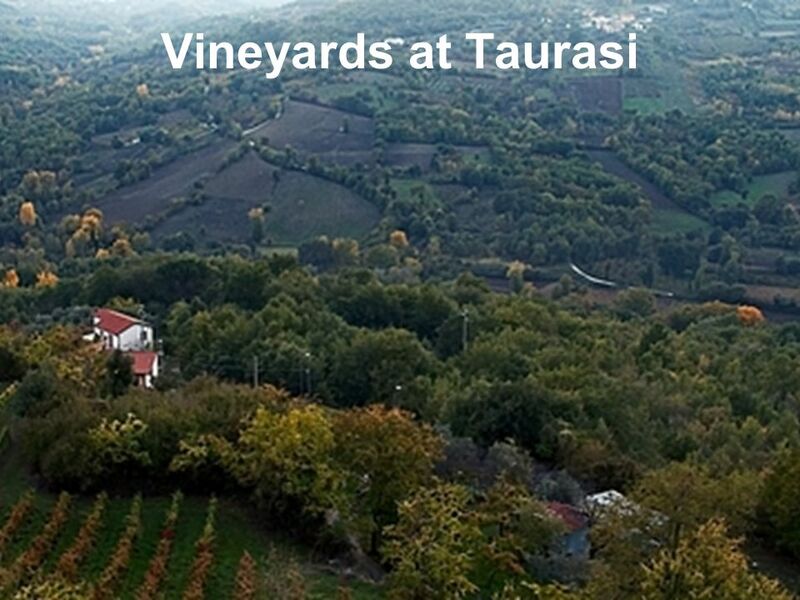 Overview Estate Owned by: Robert and Gudrun Cuillo Wine Region: Toscana Winemaker: Stefano Chioccioli Total Acreage Under Vine: 38 Estate Founded: 1992.